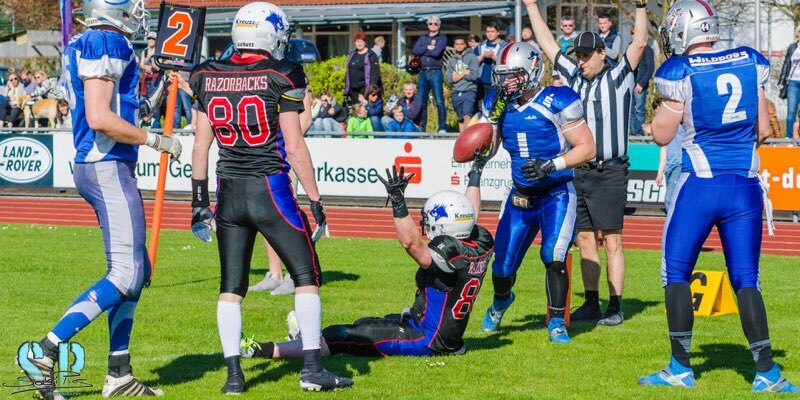 How to write about our 26-24 victory over the Frankfurt Pirates Sunday? Frustrating, maddening, like pulling teeth, difficult for all the wrong reasons. It was probably as unrewarding a win as I’ve been a part of in 25 years of coaching football. In my last blog I pointed out that this space has dual purposes; to inform the public about my adventure in Europe, and as a voice directly to the Razorback players I coach. There are things I’d like to say to the first audience that wouldn’t be appropriate to publish in my role as a coach. It will have to suffice to say that the conditions we faced on Sunday made it impossible for us to carry out our game plan. I was very happy to leave Frankfurt and very glad we will not play there again. Beyond the conditions, we did not start well, playing very sloppy football before hitting our stride. I’m mostly proud that, in the end, we were able to overcome the obstacles and come away with a very ugly win. I hope this experience has shown our players that strange things can happen in football and that we can’t take anything for granted. This week we will face our toughest test so far this season, and will have to start much better. I apologize to my non-Razorback audience for such a vague post. I think the Razorbacks will understand, the rest of you will have to wait for the book. When that comes out it will have a LOT to say about the Razorbacks vs. Pirates! First impressions are sometimes misleading. After our first game, I wrote about the dead atmosphere, the strange field with no lines or time clock, the sloppy play and the unusual pre and post game rituals. I’m afraid I didn’t do the Euro-game justice. 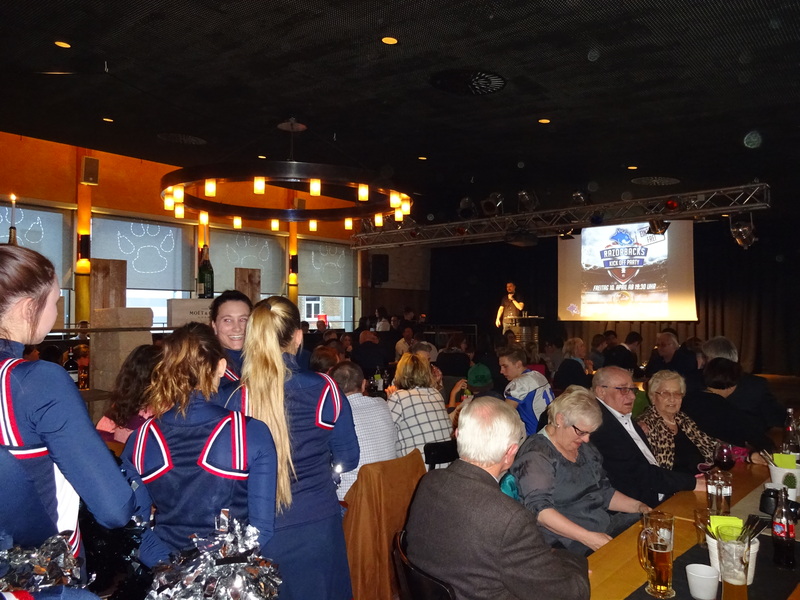 This Sunday against the Pforzheim Wilddogs was completely different. I know some of my positivity is the result of an outstanding offensive performance; (Something that tends to put an offensive coordinator in a happy place), but Sunday felt like good, exciting football in California, Nevada or even Texas. It starts with the location. 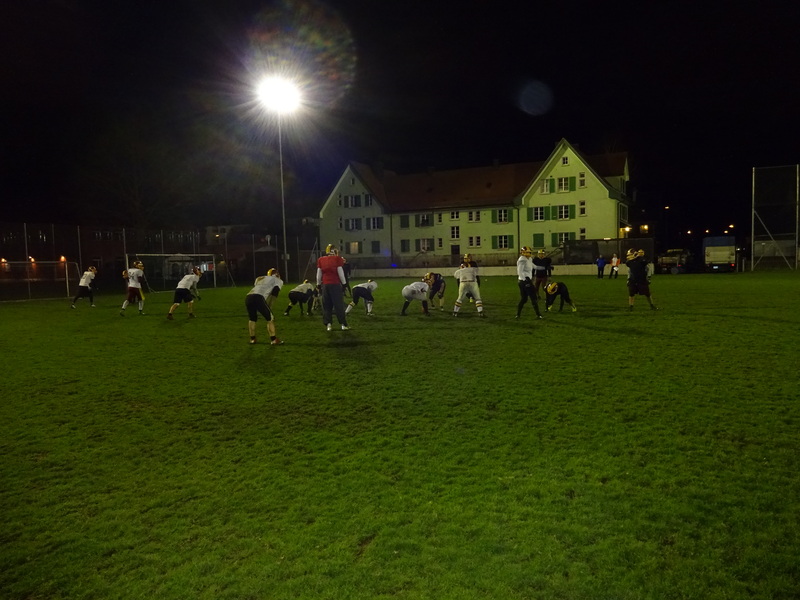 The Razorbacks played our first game at Lindenhofstadiun. Nobody will mistake Lindenhof for Cowboy Stadium, but it’s a gigantic step up from our former home at a glorified practice field. With 900 covered seats, locker rooms, a good sound system and over 1000 fans in attendance, the energy was great…Still no game clock, but you can’t have everything. It was a beautiful afternoon for football and, for once, the Razorbacks started well. Our first scoring drive took five plays (a hitch to Joris Strobel), our second three (a run by Garett Colao). The tempo was set and we didn’t let up all half. All five of our first-half possessions resulted in touchdowns. Our defense was great as well, holding the Wilddogs to one score. Razorbacks 35-6 at the half on the way to a 42-6 win. What makes football wins more special than victories in other sports is the amount of effort that goes into a single game. Each game is a culmination of thousands of man-hours and weeks of preparation. Here, this is compounded by the organization of the actual event. The team is responsible for marketing the game to the community, for lining the field, for setting up and manning concession stands. Pulling off a successful event is rewarding in its own right… ending it with a convincing win just makes it that much sweeter. As for the football, this wasn’t just a case of one team being overwhelmed. We played well. Our quarterback, Garret Colao, passed accurately, but more importantly, almost always made the right decision, the most important attribute for a QB in our scheme. Safety Jeremy Stewart picked off two passes. During the half I heard some of our players joke, “Our Americans are better than their Americans.” But that misses the point, our Germans played very well too. Football is the ultimate team sport and a quarterback is only successful if receivers to catch, running backs carry and linemen protect and open holes. Garret threw well and made outstanding reads in our run game, but the ball-carriers, receivers and linemen are overwhelmingly German. The truth is, our Germans were better than their Germans. We have two receivers who, I believe could be effective college players in the States, two German running backs scored touchdowns and every linemen is a local. Ten of our defensive players are German. …But as nice as Sunday was, it’s over. Players, please remember what led to our success; outstanding execution. Execution earned by good participation and hard-work during practices. We must start fresh to earn another great Sunday next week in Frankfort. As I’ve said before, a great benefit of this job is having such great places to spend free-time. 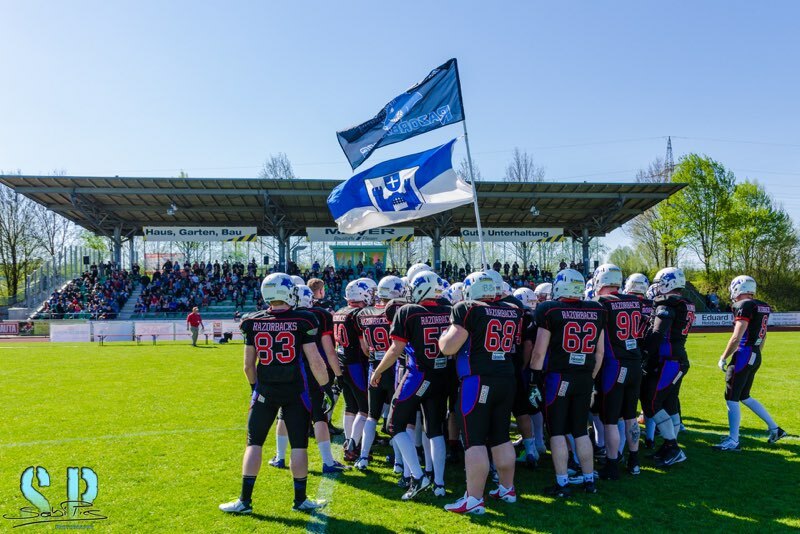 This Sunday, I went with a few coaches to a second division game in Austria between the Cineplexx Blue Devils of Hohenems and the Traun Steelsharks. As you can see the scenery was amazing and the weather was beautiful. It reminded me a lot of a minor league baseball game in the States. The Blue Devils had a cheerleader/PA announcer constantly hyping the crowd and nobody in the stands seemed too invested in the outcome. 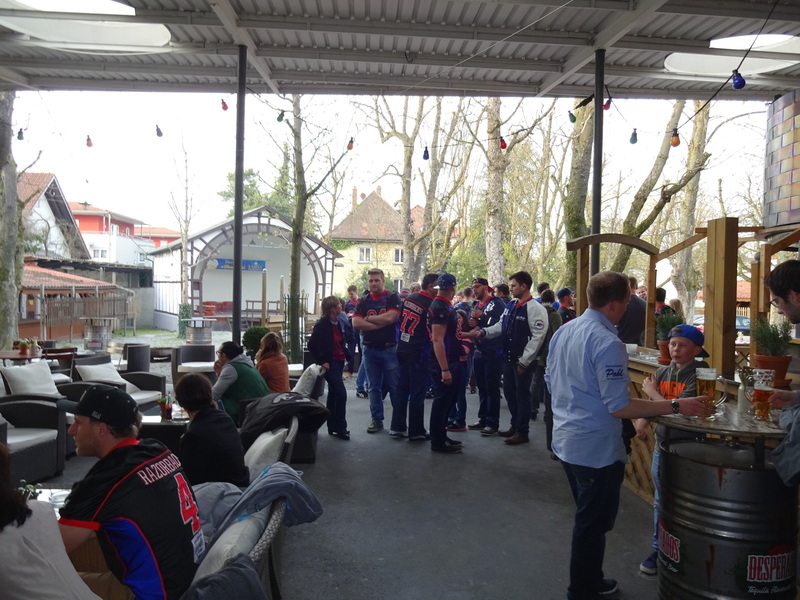 Watching the game, for most, was just a nice excuse to sit outside, be entertained and drink some beer… again, just like minor league baseball in the US. It was a very enjoyable afternoon. The game came down to the final minute with the home team Blue Devils holding on to a 14-13 lead. I had a chance to eavesdrop on the Blue Devils’ coach ripping his guys after the game for their sloppy play, telling them that is what they should expect with so many missing practices… Hmm, sounds familiar, but that’s another story. 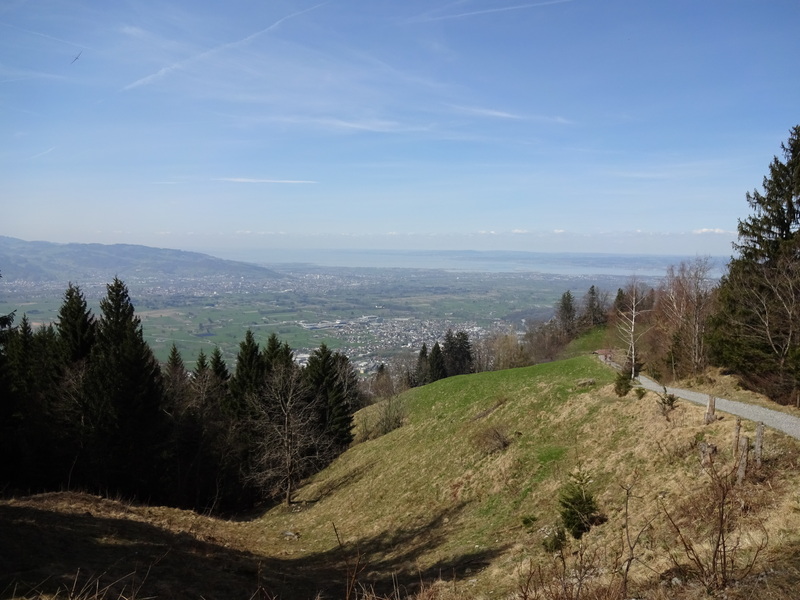 If you look closely you might be able to see where we are staying on the other side of Lake Constance! Now that skiing’s over for the year, time to start thinking about my other outdoor hobby, hiking. 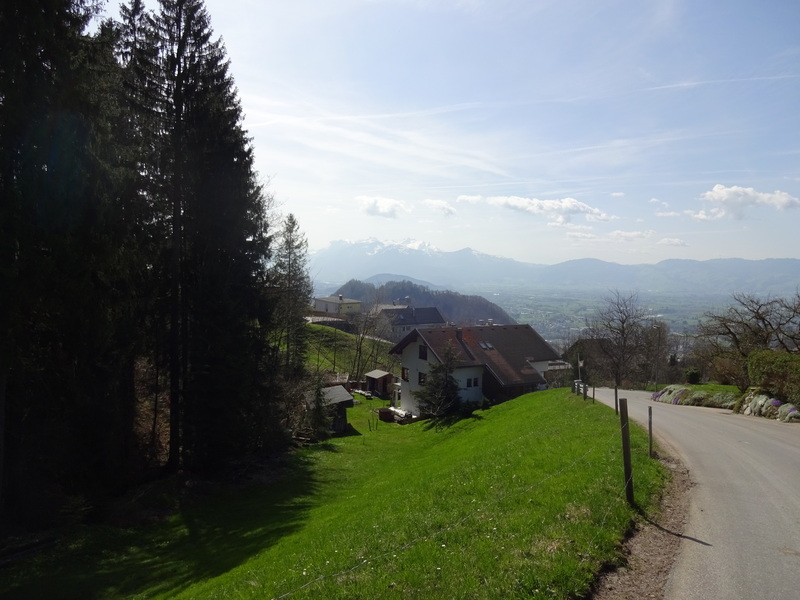 The mountains were so beautiful that day that I decided to take a train down yesterday and get up into the hills. I had a great hike. I’m sure I’ll go back again in the months to come. Several months ago, the Texas Education Association announced that the La Marque Independent School District would be dissolved due to poor performance. The La Marque community responded and last week, a conditional reprieve was granted. I’m happy for the people of La Marque. I can’t claim to be an expert on the schools, but during my week there in 2012, it was clear that many good things happen on the high school campus and the school is worth saving. That said, the method LMISD must use to “prove” their worthiness to the state of Texas is disappointing, if not surprising. In Big and Bright, I strongly endorsed the Texas model of extra-curricular activities. 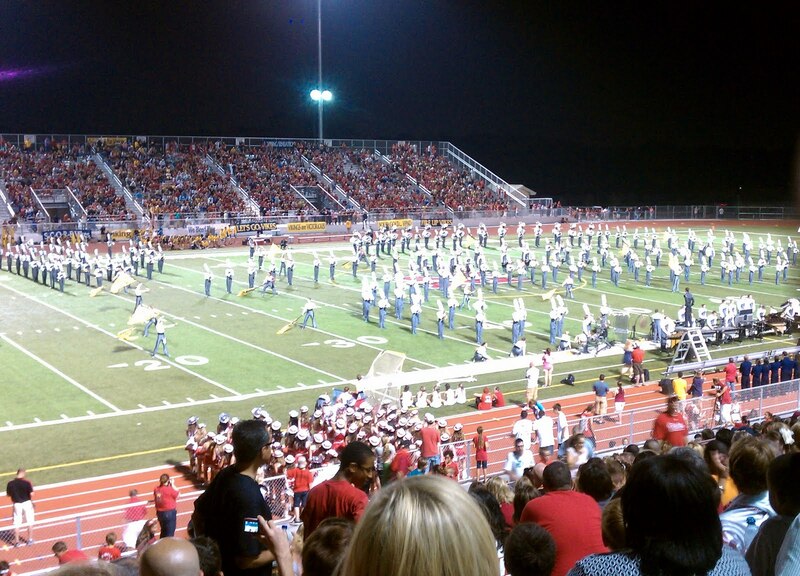 My focus was football, but other athletics, the arts, marching bands, and drill team are also outstanding. With the nationwide trend away from well-rounded, comprehensive education, it is wonderful that, in Texas, excellence is taught by a broad range of activities and that Texas schools do strive to offer things almost any student can get excited about. But, as good as Texas extra-curriculars are, it is likely the nation’s worst when it comes to reliance on high-stakes, standardized testing. Much worse than my home in Nevada where, as a teacher, I saw the effect the slow creep of increased testing has on schools. When effectiveness is measured by such a superficial and easily-manipulated method as test scores, everything else is tossed aside. Arts, industrial arts and athletics budgets were slashed in order to achieve better test numbers. If a non-testing teacher (PE, arts, shop, music…) retired, the position would often be dropped and the allocation would be used to hire a reading or math specialist. When my last high school was built in the 60s, an entire wing was devoted to industrial arts. The building had a woodshop, metel shop, auto shop, architectural drawing room, ceramics room and electronics room. The boys’ PE office has room for five teachers… When I left, ALL of those programs were gone and I was the only PE teacher in that office. By then, one administrator at each high schools only real responsibility was the raising of test scores. This would be fine if tests truly reflected student growth, but students are people, not machines, and their future success will be dictated by things much more substantial than test scores. By focusing on the tests, true education is sacrificed. I’m sure these sacrifice have already begun in La Marque. Likely, class time will focus entirely on test-taking skills. In English, literature and creative writing will be scrapped for more grammar and spelling. Wherever possible, non-tested areas such as arts and athletics will be asked to sacrifice their programs to help save the school. This isn’t the fault of the good people of Le Marque, they don’t have a choice; this is the game the state of Texas requires them to play. The effort may or may not help them achieve the required score…I hope it does. But, between now and the testing very little education will take place in La Marque. One of the advantages and disadvantages of coaching football in Europe is the amount of downtime. With only two practices a week, coaching players who have real 9-5 jobs, the imports who come to play or coach have a lot of free time. This could not be more different than the American model where coaching is an every day job. When I was a head coach I worked 80 hours a week during the season, these last two years, as a high school assistant I still put in around 40. Here in Germany… I’d feel guilty if I did the math. Right now is particularly slow, with the Easter holiday and two bye weeks leading to our league opener. 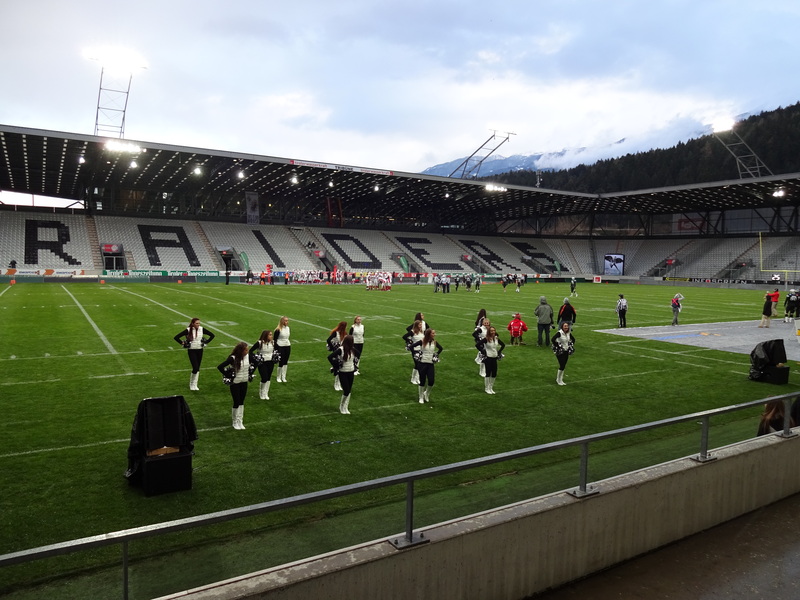 Not being very good at off days, I was excited to learn a Battle4Tirol game between Austria’s Swarco Raiders and the Stuttgart Scorpions would be played on Easter Day, only two hours away, in Innsbruck. I immediately decided to make the trip. 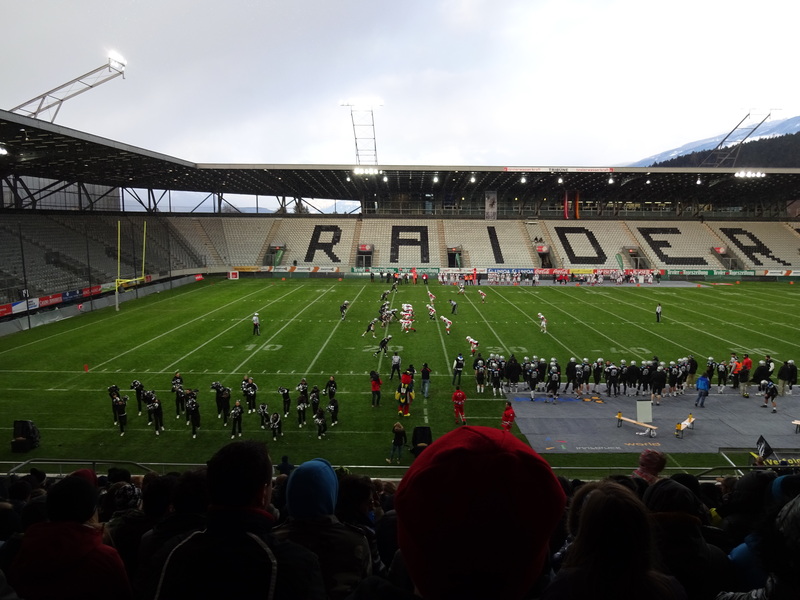 The Swarco Raiders are playing three separate schedules in 2015; the Austrian Football League (AFL), the Battle4Tirol and the Big 6. The Battle4Tirol is a four game exhibition schedule against other strong European programs. The Big 6 is an international tournament between some top teams in Europe, and purportedly crowns a European champion. It sounds simple, but playing such a schedule creates some problems. The teams in these tournaments play for various national leagues and use different rules. 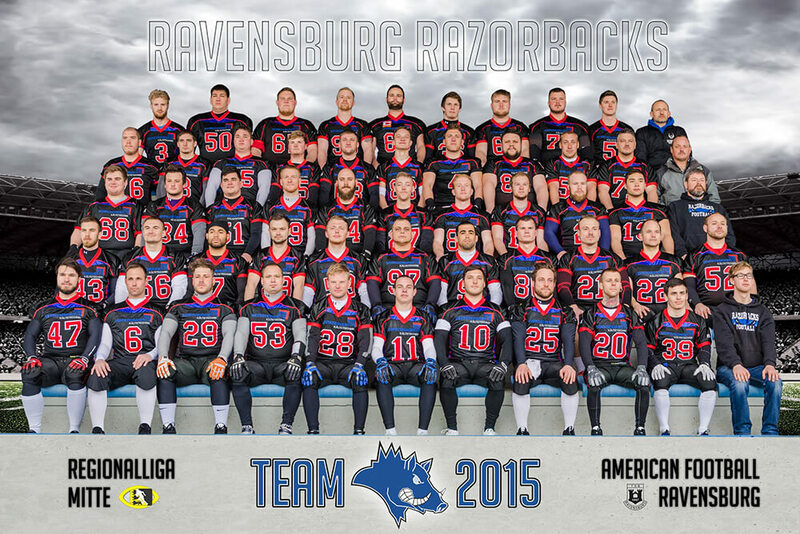 In Germany, a team may have two American imports on the field, while in Austria it’s only one, for the tournament however the number is three. The schedule itself, however is the strangest complecation. 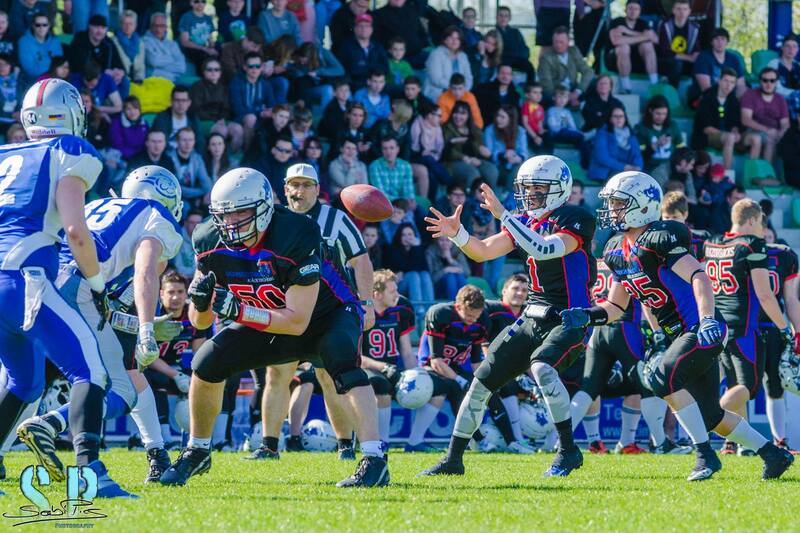 The Raiders entered this game coming off a loss to the AFL’s Danube Dragons the previous day. 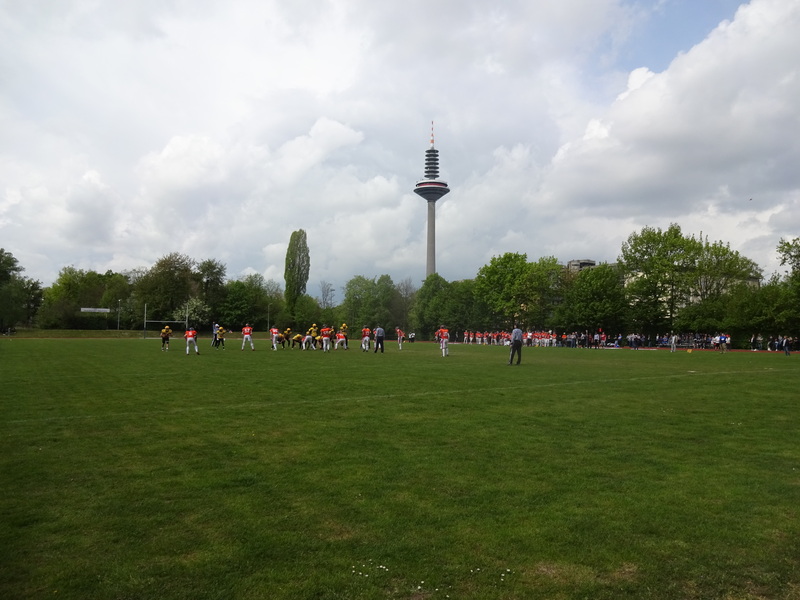 You read that right; the Swarco Raiders played a league game on Saturday, then turned around and played Stuttgart on Sunday. I’m told playing games on consecutive days is not unheard of in Europe. My coaches’ mind has a million questions about the logistics of preparing for two games in the same week, also about player recuperation. Once-a-week football is not an arbitrary invention, but stems from the fact that it takes about a week for the body to recover from a game. Questions aside, I was excited to finally see firsthand top division European football. –The fans cheered the officials’ introduction. I’ve never seen that before. 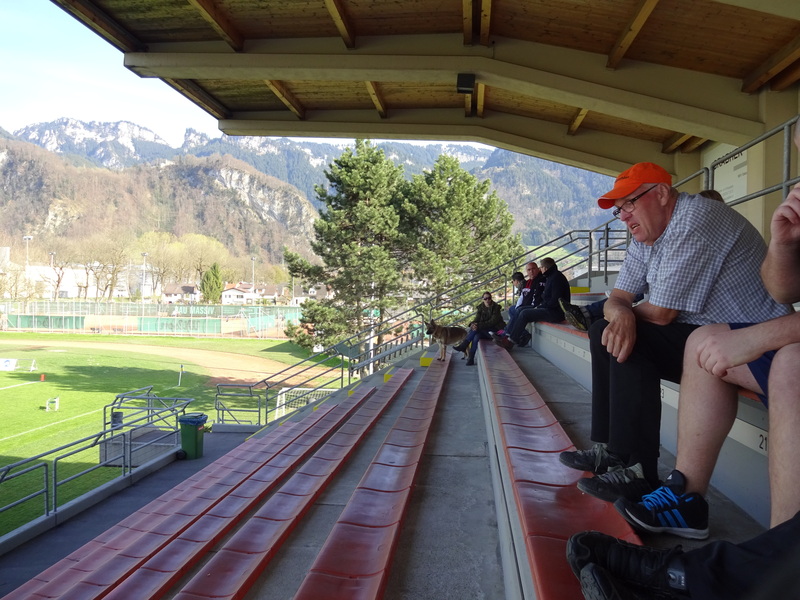 –People smoking in the stands… It’s been many years since I’ve seen that in the US. — Before the game, a video was shown giving a brief explanation of how football works. Again something I’ve never seen in the States, but it makes sense here. 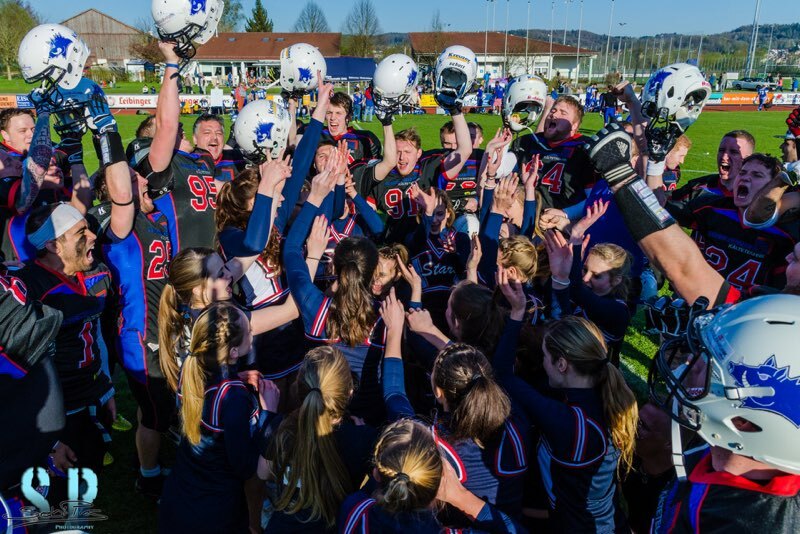 –I’m finding that Europeans seem to love the spectacle of the game as much as the outcome… Starting players are always introduced and take the field individual, a practice generally reserved for the Super Bowl in the US. Fans would cheer nice offensive plays, even if they were made by the opponent, but would rarely cheer a big defensive play, even if made by their team. Lots is made of the ceremony; coin tosses, MVP award presentation for both teams and saluting the crowd for coming to watch were all part of the show. –The football itself was good but not significantly better than what we play in Ravensburg. The setting was more professional, but the game is essentially the same; a handful of American imports and a lot of reasonably strong European players, working hard, but still with rough spots in their play. I saw some very nice plays, but also dropped balls, penalties and poor snaps. You can get better descriptions of the game action elsewhere, but a few words on that. During the first half both teams played very tight with the Raiders taking a 9-3 lead. After trading TD’s early in the 3rd Swarco began to overpower the Scorpions, pounding the ball into the line and mixing in some deep balls when the defense sold out to stop the run. The 4th quarter was all Raiders who cruised to a 34-9 victory. 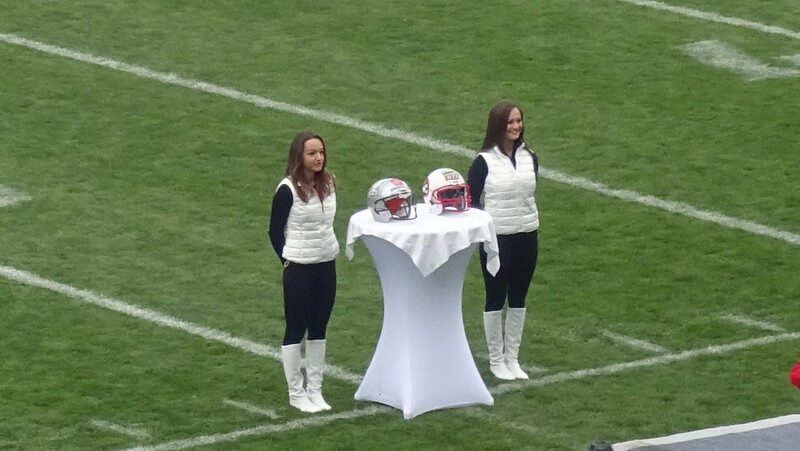 In one more very European ceremony before we left, the defeated Scorpions presented a red and white Stuttgart helmet to the Raider MVP. It was a very nice night in Innsbruck. Great company, a beautiful setting and football on Easter!!! What more could anyone want? Dragan Belic, me and Coach James Bryant in Innsbruck. A long-time import coach in Europe told me, “Always have a plan B for practice over here.” Wednesday night, I had my first taste of this. I’m often told stories about practices with 10-15 players showing up, making it impossible to run a full offense and defense but, so far, the Razorbacks have relatively consistent. Before last week we could always scrounge together a productive unit on both sides of the ball and run plays. The combination of awful weather, two straight bye weeks and a holiday weekend was too much for many of our players. Two starting linemen, all of our running backs and about half of our receivers were somewhere else. Plan A had been to install a few things that were missing for the Twister game… but that was impossible, so plan B was implemented…In truth, plan B becomes finding whatever things it’s possible to work on with limited personnel. Put another way- Winging it. This is never a good feeling for a coach. We always have a plan and football, more than any other sport, is all about organization. An unorganized practice makes me feel like I’m not doing my job and that we are falling behind our upcoming opponent. I was given another piece of advice from an import coach, “If you are an uptight, by the book coach, a job in Europe will make you crazy, because things often can’t be done by the book.” I’m not crazy after the poor showing on Wednesday… but PLEASE Razorbacks, only two weeks until our league opener, we need to get some things fixed this week. BE THERE WEDNESDAY NIGHT!!! 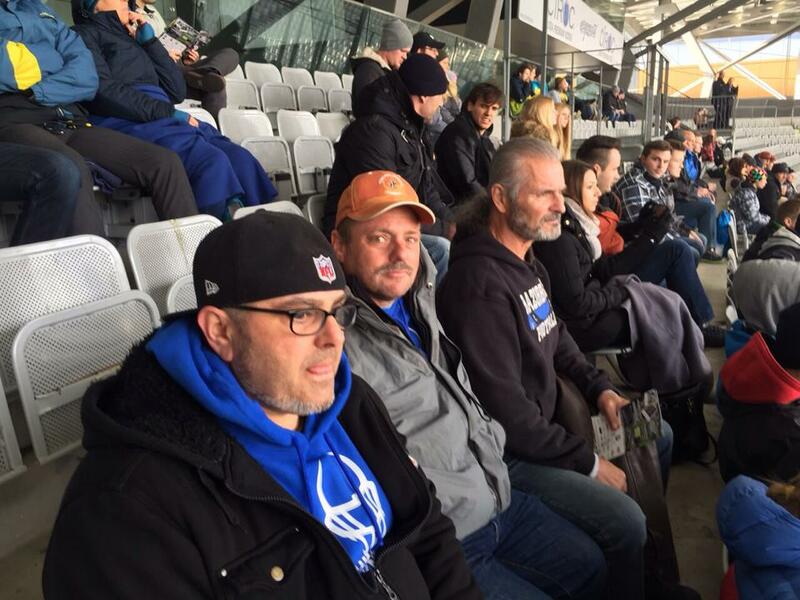 Tuesday, the other Americans and I made our first trip to Switzerland to visit the Winterthur Warriors. When I was looking for a coaching home in Europe last fall, I had several talks with the Warrior staff, coaching didn’t work out, but they invited me to come visit and I love watching other teams practice. Nothing makes you consider what you do like watching how other programs address similar issues. Head coach Antonio Morosco allowed us to sit in on the team meeting and told us to feel free to jump in with any tips and observations as we saw fit. 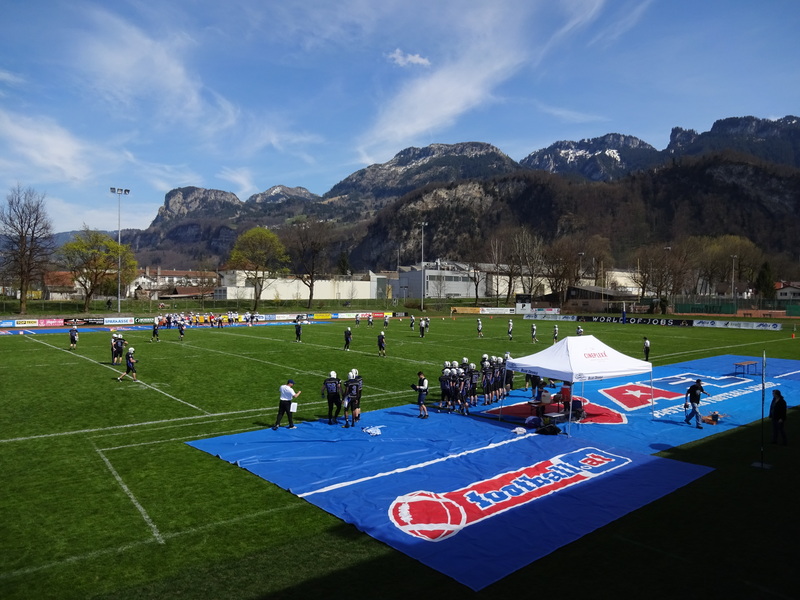 The Warriors play in the Swiss 1st division and have a great facility and a well organized staff and program. I had a good talk with Matt Mercy, the 26 year old offensive coordinator from Tennessee. Mercy spent two seasons playing offensive line for the Warriors, before returning this year to coach. Like me, he wears a lot of hats during a calendar year, coaching in the US in the fall, coaching wrestling in the winter, before traveling to Europe to coach in Switzerland. Practice was well organized and the Warriors flew around. It was a very physical practice, with lots of live scrimmaging. The main difference between what I saw in Switzerland and what I coach in Germany is the experience level of the players. While we have plenty of newer talent, all of our starters have a few years of experience. Coach Mercy pointed out the right tackle, a player in his mid-20s who is in his first year playing football. He is a police officer and is clearly a tough guy, but very raw. I spoke with a rehabbing offensive lineman, a 28-year-old hockey player who was told about football five years ago. 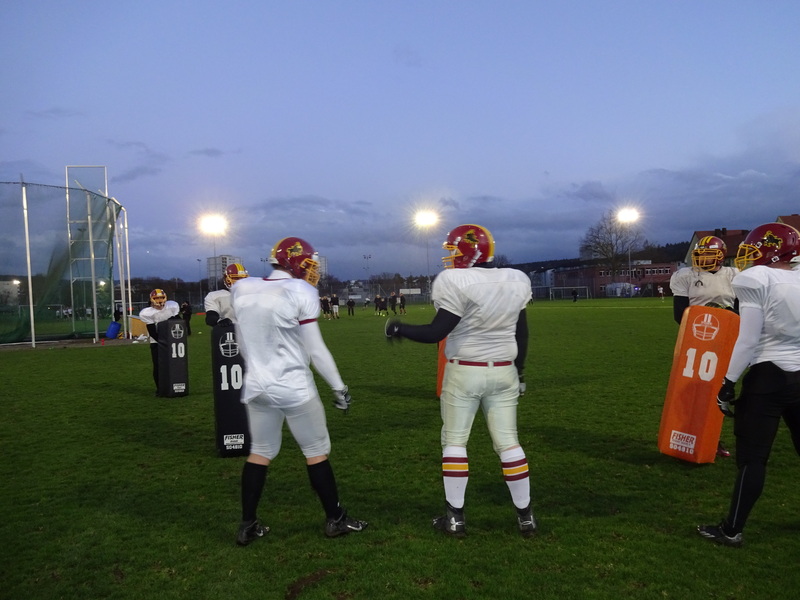 Mercy also told me one of the defensive tackles is 44 years old and, “Has been playing football as long as I’ve been alive.” Strange stories by US standards but common in Europe where the teams are mostly made up of whoever shows up. Good luck to the Warriors this week against Basel!!! 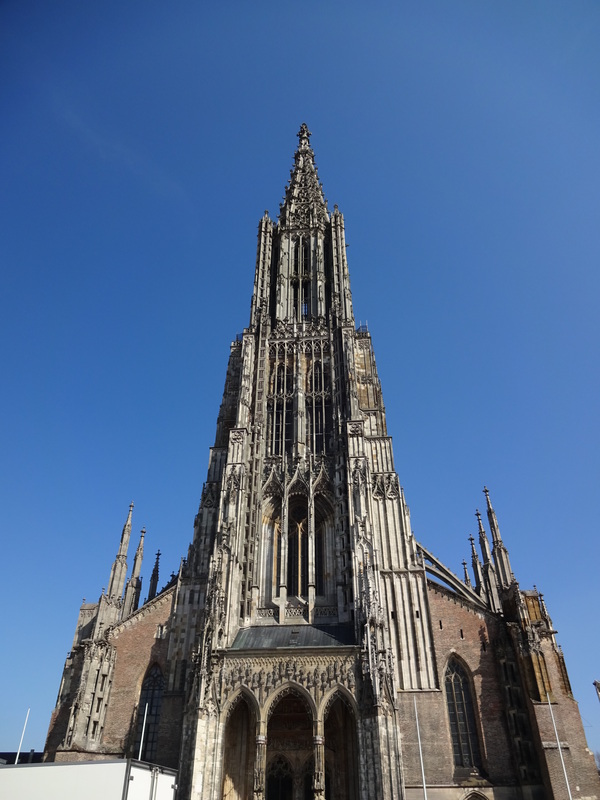 I took a quick trip up to Ulm last week, home of the tallest church in the world. Even more impressive is that for five Euros you can walk the stairs all the way to the very top of the steeple… 768 steps! It’s a little scary as the spiral staircase is very narrow and there are many windows showing just how high and exposed you are, but it’s definitely worth the effort. Staircases wind up in each corner, then right up the center of the final triangular section.